Platinum is considered the most prestigious of all the precious metals. Since it is a naturally white metal, it is more truly white than any white gold. It is very dense and highly malleable, physical characteristics that are preferred in certain complex designs. Although platinum was known to have been used as early as 700 BC in Egyptian decorative objects, it was not until the 19th century that it became popular for use in jewelry. 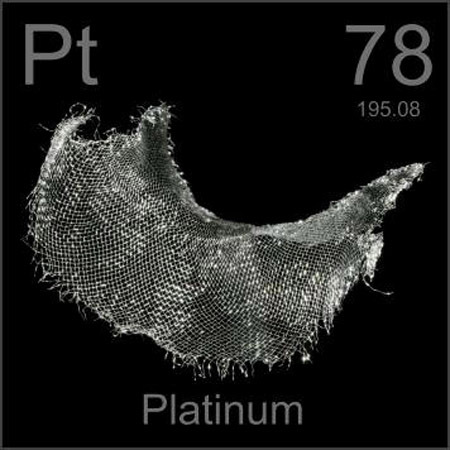 Previous to the mid 1800s, platinum’s high melting point of 3190° F presented an obstacle to its use. The invention of the oxyhydrogen torch enabled jewelers to work with it. Throughout the late 1800s and early 1900s, it was coveted as the best metal for engagement rings and other significant gemstone jewelry. At the outset of World War II, platinum was declared a strategic metal by the US government and prohibited from use in non-military applications. As a response to platinum’s unavailability, white gold was developed to fill the demand for a precious metal with a silvery color. During the 50s and 60s white gold jewelry sales eclipsed those of platinum. Platinum enjoyed a widespread resurgence in popularity in the 1990s, and has continued to be the most desirable metal for certain types of jewelry. 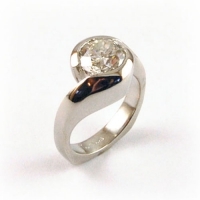 Because of its superior density, platinum is much less prone to wearing away than white gold. Vintage rings that have been worn for three generations are often in excellent condition. A similar design in white gold would have required thorough rebuilding, given the same amount of use. All precious metals are subject to scratching in everyday use. They are all considerably softer than tool steel. Platinum will not hold a bright finish as well as white gold. It is worth considering a matte finish, or a design that does not present broad surfaces. Of the metals we use at Equinox, platinum is the most expensive. Although the price per ounce for platinum and for gold are not very far apart on the commodities market, platinum’s richer alloy content, its greater density and certain technical issues in manufacturing all contribute to the substantially higher price of finished platinum jewelry. Platinum weighs 1.6 times more than 14K gold, so a ring of the same volume will contain 160% more weight if manufactured in platinum than if made in 14K gold. The platinum content in jewelry is very high: either 90% or 95%, depending on which alloy is chosen. Compare this to 14K gold, which contains 58.5% gold, and 41.5% alloy. We source our platinum from Hoover & Strong and Johnson Mathey. Currently, most of our platinum is not recycled, but we are working toward working exclusively with recycled platinum. By using recycled platinum, our refiners are able to reduce the quantity of waste products by 60%. We will be happy to discuss the merits and drawbacks of each of the metals we use at Equinox and help you decide which is best for your needs.